I'm a strong believer in standing up for your rights. I've blogged about it before, but as some of you who follow me on Twitter or Facebookwill be aware, I was forced to fight for my rights in front of a judge today.Back in 2010 I was made aware of 6 of my images being used on a website by photographer Damien Morley alongside prices that he charged for photoshoots. Obviously I hadn't supplied the images to him to use, nor was I receiving any payment for their use, so I sent him a letter with an invoice (at the amount he was advertising the cost of such photographs to be, rather than my own figures) for his usage of them and said that if he settled my invoice then nothing more would be said of it. Mr Morley took the images down (which in itself demonstrated to me that he knew that he was at fault), but he made it clear that he wasn't prepared to pay. So I was faced with a dilemma: do I leave things there, or do I take things further? After all, he was using MY images, to promote HIS business, and had I not contacted him, the images would most likely still be there. As far was I was concerned, it was a no brainer. This was my first experience of the court process, so I wanted to share a little bit of what happens for those who are unfamiliar with how it all works. I opted for a small claims track on this occasion. Sure he had infringed my copyright, and I could have gone to the high court, but that would be been far lengthier and costly, with a higher probability that the compensation amount would have been too high for me to ever receive a penny of it. So I started the process online through the official website. To initiate a claim costs £70, and is relatively straight forward to do. You're guided through the process step by step, beginning with being asked for the relevant details of your claim and why you think you're entitled to payment, compensation etc. Once in the system, both parties are notified by post with the claim number and the court details. It's at this point that the other side can issue a defence, a counter claim, or pay up to avoid matters going any further. It's important to note that court should always be a last resort, and only as a result of the two sides being unable to reach an agreement. To that end, the court offer a free mediation service. This is entirely voluntary, but one that should definitely be considered. In my case, Damien Morley filed a defence, claiming that he'd had permission from the model agency that supplied the images to him, and therefore was refusing to pay. We had both opted for mediation, so on a cold friday morning in late January a mediator spent about an hour trying to negotiate through phone tennis between the two of us. At this point I was more than happy to compromise on the figure, but Mr Morley refused to change his position from not wanting to pay a penny. As such, the mediation was always destined to be a failure. Following the inability to resolve the case through mediation, the next step was the preliminary hearing. This is where the judge looks at the basics for the case before giving it a final hearing date. Again, this can also be used as an opportunity to put an end to proceedings. Mr Morley didn't show up to the preliminary hearing, which meant the case had to be referred to a final hearing. After the final hearing date comes through in the post, it's time to pay some more money. 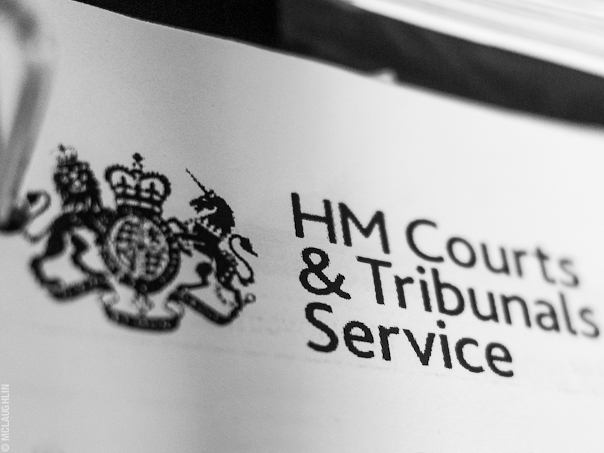 The final hearing costs £165 and must be paid within a certain date. At this point, you also need to send all your evidence, along with a witness statement to both the court, and the other side. This needs to be done within two weeks of the court hearing. You should receive the defences evidence and statement during this time as well. Failure to supply documents could result in them being inadmissible in court. The court date comes around quickly enough, and then you'll find yourself sitting in the waiting room, in my case for over 2 hours! The court separates the hearings into morning and afternoon. Morning hearings start at 10am, but that doesn't mean your hearing will be at 10am, so be prepared to wait! Once called in to the judge, both sides are asked questions relating to the case and their version of the facts. The judge will look at any evidence that you refer to, taking into account both parties statements and positions, before making a ruling. My particular hearing probably lasted around half an hour. So what was the result? Well quite early on, the judge ruled in my favour with regard to whether I was entitled to a sum of money. He did reduce the amount payable from the amount that I had originally claimed, however, due to the timescale the images were supposedly used for. At this point the judge will also add on any court costs, interest, and other costs incurred as a result of the case, provided they can be proved. It's important to note, that this was never about the money for me. This was about fighting for my rights. I've now gone through the court process, and understand how to get a favourable verdict, so should someone else try and use my images commercially without permission, I know what's involved in order to go to court and win!